We’d love your help. Let us know what’s wrong with this preview of Around Harvard Square by C.J. Farley. It’s the nineties, and Tosh Livingston, straight-A student and superstar athlete, is living the dream—he’s made it out of upstate New York and into the incoming freshman class at Harvard University. But after an accident blows up his basketball-playing hopes, he discovers a new purpose in life—to win the frenzied competition for a spot on the staff of the Harvard Harpoon, It’s the nineties, and Tosh Livingston, straight-A student and superstar athlete, is living the dream—he’s made it out of upstate New York and into the incoming freshman class at Harvard University. But after an accident blows up his basketball-playing hopes, he discovers a new purpose in life—to win the frenzied competition for a spot on the staff of the Harvard Harpoon, the school’s legendary humor magazine. To ask other readers questions about Around Harvard Square, please sign up. Let me start by saying, just based on the premise I really wanted to like this book. As a black college student attending a predominantly white institution (PWI), I was very excited to read this book. At first I was very on board, the characters were likable and diverse, there was a bit of intrigue and mystery, further encouraged by a plot twist I totally didn’t see coming. I felt the college experience was represented well, especially with Tech’s attitude toward discussing race. The second pers Let me start by saying, just based on the premise I really wanted to like this book. As a black college student attending a predominantly white institution (PWI), I was very excited to read this book. At first I was very on board, the characters were likable and diverse, there was a bit of intrigue and mystery, further encouraged by a plot twist I totally didn’t see coming. I felt the college experience was represented well, especially with Tech’s attitude toward discussing race. The second person parts of the story were interesting and different from other novels, so I was excited to see where that would lead. Then the story became increasingly confusing and the satire started to fold in on itself until I, as the reader, was left to untangle a very large knot of deceit and false intentions. I was very disappointed in the ending, as it felt rushed and did not feel like the ending that the buildup deserved. AROUND HARVARD SQUARE by C.J. Farley. I received an ARC (Advance Reading Copy) from Akashic Books for an honest and unbiased review. AROUND HARVA AROUND HARVARD SQUARE by C.J. Farley. 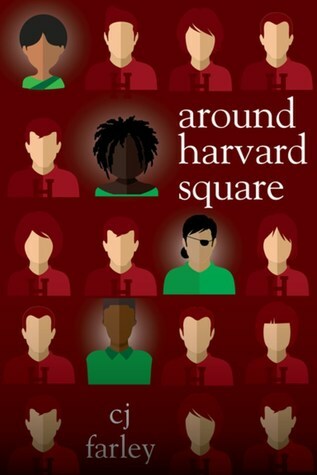 AROUND HARVARD SQUARE is a coming-of-age story; a story about friendship; a story about class and elitism; a story about colleges with their faults and hypocrisy and scandal laid bare. It is very self-deprecating, humorous, witty and fast-paced. It is filled with interesting and bizarre characters - Tosh ‘Tech’ Livingston, Lao, Meera, D2 - Dorian & Davis, Professor Hyacinth ‘The Chair’ Bell, Tilfer Peerpont, Spooner Peerpont, Morven S. Morlington (editor of the Magenta), Festus the Hummingbird and Zippa (Zipporah Windward) of ‘ram pa pa pam’ fame. It is filled with interesting and bizarre terms and events - Ubersectionality, Final Clubs, Comps, Compers, the Harpoon (a Harvard student-run publication), pranks gone amuck, illegal disposal of sewage, suicide, corruption, inept college programs and personnel, vandalism, great wealth, prejudice, racism, sexism, student activism and inhumane treatment of hummingbirds. I think I am a bit too old to be able to understand this book. There. I’ve owned up to that. I mean, I get that it is part farce. I know what a farce is - a theater piece marked by humorous characterizations and improbable plots; a ludicrous show; a mockery. And I get that it is part satire - irony, derision, or caustic wit used to attack or expose folly, vice, or stupidity. And I get that it is comedy. What is the book when it is a sum of all three parts? For me, it was part laughing out loud, part confusion, part admiration of the author’s cleverness and imagination, part sadness and part irritation. You see, just when I was beginning to ‘get’ what was going on and understand the characters better and glad that that smug creep, Spooner Peerpont was ‘going to get his’, I realized with a sinking feeling that I had been royally, mercilessly, Harpooned. And it hurt. I don’t want to spoil the ending. It is a bit complicated (or it was for me). I did like reading about the author, C.J. Farley. He is a very renowned author and editor. This book was so, so promising at the beginning and became increasingly so confusing and seemingly pointless towards the end that I was almost thankful it was over. I'm not interested in philosophy at all, so I didn't care about all the philosophical themes. If you're interested in philosophy, wonderful! I just felt plain stupid reading all of their philosophical conversations. Small thing to nitpick: but I absolutely h ARC provided by the publisher via Edelweiss in exchange for an honest review. This book was so, so promising at the beginning and became increasingly so confusing and seemingly pointless towards the end that I was almost thankful it was over. I'm not interested in philosophy at all, so I didn't care about all the philosophical themes. If you're interested in philosophy, wonderful! I just felt plain stupid reading all of their philosophical conversations. Small thing to nitpick: but I absolutely hated how an androgynous student was referred to as "she/he," considering how politically aware the book was in other areas. I was also struggling to understand what the plot was, and I realized I was 50% into the novel and still had no idea what the plot was and I still kind of don't. I don't like how the character's struggles were revealed and none of them "paid off." The reasoning behind why Tosh hated his nickname "Tech" was so anti-climatic it was almost impossible to think that was a real plot device at all. I hated the fact that Tosh spoke in the second person when referring to Zippa because she didn't seem that special to me at all. I also hated the fact that a lot of the plot later on in the story was about avenging the death of a person they all felt was so important, but they rarely interacted with that character at all, so it was hard for me to understand why they would go to such lengths to avenge their death for someone they only interacted with a small handful of times! The whole storyline with Tosh's father and sister was so pointless and was never resolved or even really spoken about. The relationship between Zippa and Tosh was too much of a stretch for me. I don't even know how to explain in a new way how pointless so many scenes seemed to me. I spent the majority of the book thinking "What the hell is going on?" and "Does this actually happen at Harvard?" Around Harvard Square wasn't bad, but it wasn't great either. I did enjoy the camaraderie between Tosh, Lao, and Meera. Three complete misfits trying to survive their freshman year at Harvard. The story was strong by giving each character a great background and a personality that was easy to see. Even the background characters were detailed in a way that felt like a movie. Where the story fell off for me is the unrealistic way the characters some time spoke. It became a bit of a chore to read so Around Harvard Square wasn't bad, but it wasn't great either. I did enjoy the camaraderie between Tosh, Lao, and Meera. Three complete misfits trying to survive their freshman year at Harvard. The story was strong by giving each character a great background and a personality that was easy to see. Even the background characters were detailed in a way that felt like a movie. Where the story fell off for me is the unrealistic way the characters some time spoke. It became a bit of a chore to read some of their conversations. It was also a bit predictable to know that the bulliedTilfer would become a force to be reckoned with in the end. The construct of the first year in an ivy league college is by definition filled with anxiety, discovery, and change. It's ripe for satirical observation. Farley sometimes succeeds in this by looking at the characters who attempt to fit in and yet remain outsiders. However, one never believes the intelligent characters can act in this fashion. The situations are so outlandish. In the end, the satire is taken to the extreme and the ending unremarkable. I also thought that the technique of the aut The construct of the first year in an ivy league college is by definition filled with anxiety, discovery, and change. It's ripe for satirical observation. Farley sometimes succeeds in this by looking at the characters who attempt to fit in and yet remain outsiders. However, one never believes the intelligent characters can act in this fashion. The situations are so outlandish. In the end, the satire is taken to the extreme and the ending unremarkable. I also thought that the technique of the author to end chapters with readers guessing the outcome of a conversation or situation was annoying. Set in the 1990's the story centers around Tosh, a student who decides he wants to be on the staff of the "Harvard Harpoon". With a mix of diversified friends, at Harvard University he sees first hand how students of different races and social (economic) standing live. The story moves at a past pace, with attention to detail, engaging dialog , humor and well developed characters. I liked the differences each character brought to the story, and how they interacted with each other. Overall I enjoyed Around Harvard Square and feel others will as well. A definite good read. This book was tough. It was a hard start, and I almost put it down, but then I wanted to find out more about the characters. It tries really hard to be funny, and all of the quotes on the cover say that it is. There are moments, but it feels more tragi-comic than anything. I did not feel satisfied with the ending. This book feels like that confusing, sarcastic friend that you had in college that you spent time with occasionally. This book was a Best of the Best for the month of March, 2019, as selected by Stevo's Book Reviews on the Internet. http://forums.delphiforums.com/stevo1.... Search for me on Google for many more reviews and recommendations.